New Orleans witchcraft,love spells,magickal supplies. Candles,oils,incense, mojo bags. SATCHMO THE COSMIC DOG ™ WELCOMES YOU! Satchmo surfed the cosmos to bring you these fabulous magickal products. 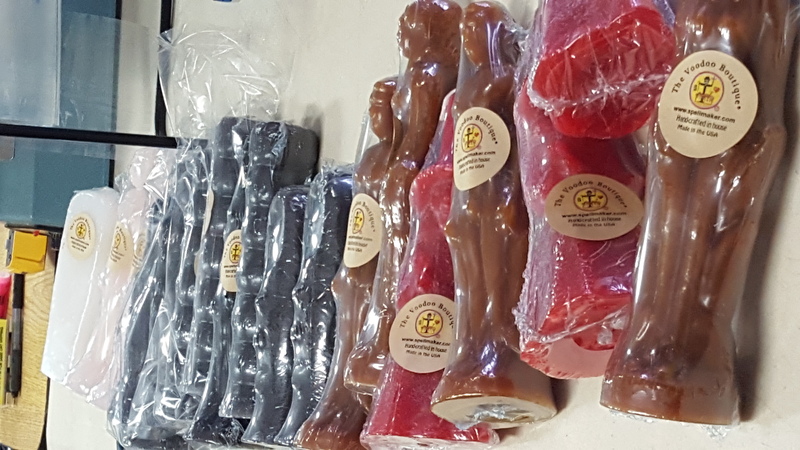 All the products offered here are hand-crafted and consecrated for you by Rev. Samantha Corfield and come with complete instructions for how they might best be used. 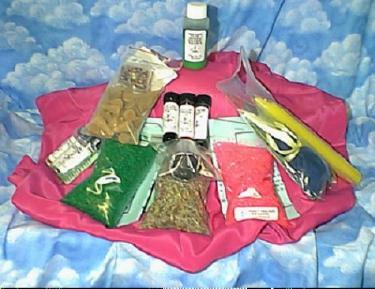 These products can be used by experienced practitioners to enhance their magickal routines OR by beginners and novices as an adjunct to spells and spell kits. These products can also be used to enrich your love life, screw around with your enemies, help bring you money, and more! Candle magick is one of the oldest, most traditional and simple forms of New Orleans Witchcraft. Our easy-to-follow instructions make it simple for even the most inexperienced beginner to successfully cast a candle magick spell! Each Candle Magick Kit listed below is a complete kit containing the unique candle, specially consecrated oil, herb pack, and complete instructions for casting the candle magick spell of your choice: Love spells, money spells, luck spells, much more! Single candle magick kits come with ONE candle, herbs,oil,and instructions. Triple candle magick kits (Body,Mind,Spirit kits) come with THREE candles, herbs, oils, instructions,and free incense. 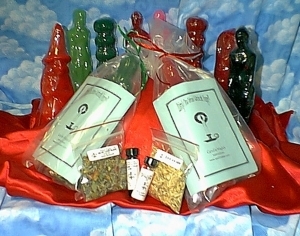 Triple candle magick kits are a great value with a much lower price than buying three kits individually. All of our candles are handmade, hand-poured, in-house by Parran Matt! Please note: All of our candle magick kits are now available EITHER in a single pack (one candle with herbs and oils) or in 3 packs for the special triple strength "Body, Mind, Spirit" work. This special formula of candle magick work was developed by Rev. Corfield to reach a person on all three levels of existence: Body, Mind, and Spirit. Instructions for this powerful work is included in the three pack. When ordering the 3 pack, you will also receive a FREE pack of our Cosmic Voodoo™ incense to burn with your candles AND a substantial discount for buying the three pack! Don't have the time or place to do your own candle work? Mambo Sam and Parran Matt are now offering candle burning services for you! If you cannot do your own candle work, we will now do it for you. 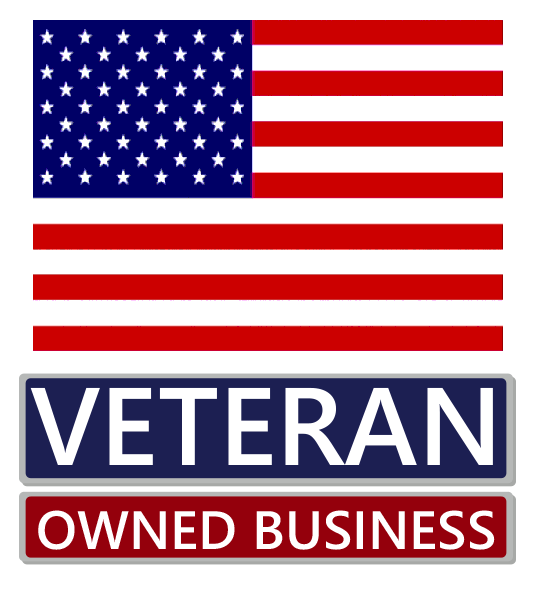 Many clients have asked us for this service and we are now prepared to offer it! RED MALE CANDLE MAGICK KIT: Red male figure candle to help gain his love or passion. Includes 1 candle, supplies, and complete instructions. RED FEMALE CANDLE MAGICK KIT: Help gain her love or passion. PINK MALE CANDLE MAGICK KIT: Enhance the romance in a relationship. PINK FEMALE CANDLE MAGICK KIT: Enhance the romance in a relationship. BROWN MALE CANDLE MAGICK KIT: Discourage advances of a man; assist in sending a man away from you or someone else. BROWN FEMALE CANDLE MAGICK KIT: Discourage advances of a woman; assist in sending a woman away from you or someone else. RED 7-KNOB WISHING CANDLE MAGICK KIT: One love wish per knob - male or female. 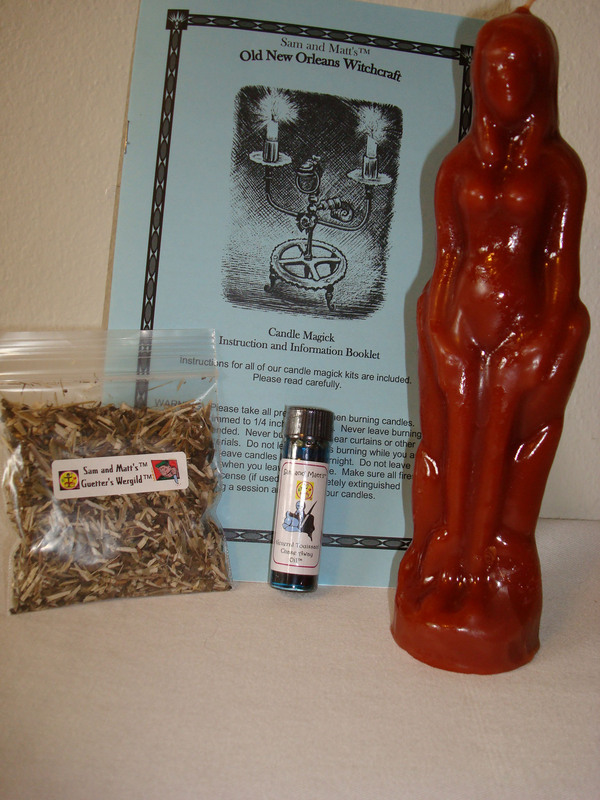 THE FAMOUS RED MUMMY CANDLE MAGICK KIT: Helps gain control of a situation. Opens communication! 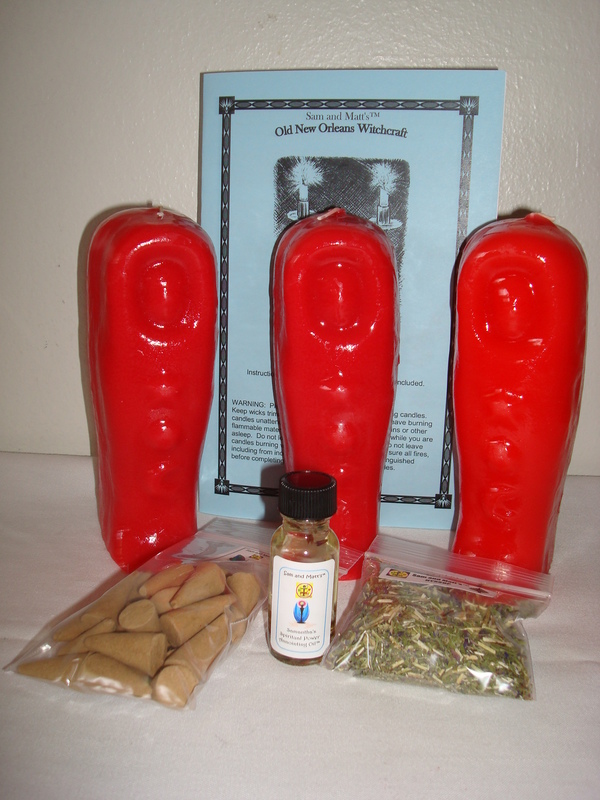 NEW ORLEANS RED WITCH CANDLE MAGICK KIT: Assists in acquiring a new love or rekindling an old love. Old New Orleans swamp witch magick. Assorted house made candles waiting for you! Candle making in our shop! GREEN MALE IMAGE CANDLE KIT: Use to bring money into your life, help with finances, etc. Change your financial status, get a better job, make more money at your present job, etc. May also be used to help someone else's financial forecast. Contains 1 candle, supplies, and complete instructions. GREEN FEMALE IMAGE CANDLE KIT: Use to bring money into your life, help with finances, etc. Change your financial status, get a better job, make more money at your present job, etc. May also be used to change someone else's financial forecast. Includes 3 candles, extra supplies, and complete instructions. GREEN 7-KNOB WISHING CANDLE KIT: A true wishing candle. Burn one knob per money-related wish. It is best to keep wishes "realistic" such as wishing for a new job, a raise, or any other money wish that is reasonable. Fine to use for gambling to enhance chances of winning. Your candles are made with care, by hand, in small batches. 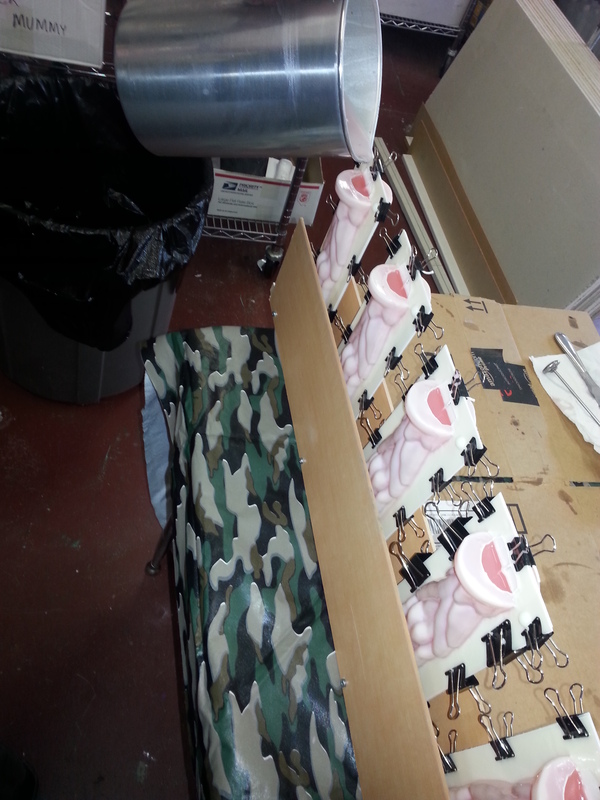 Every candle is consecrated before shipping to you. WHITE MALE IMAGE CANDLE KIT: Use this candle kit to help burn away negativity for yourself or another male. Also used to enhance spiritual endeavors, strengthen psychic abilities, and send healing energy to yourself or another male. WHITE FEMALE IMAGE CANDLE KIT: Use this candle kit to help burn away negativity for yourself or another female. Also used to enhance spiritual endeavors, strengthen psychic abilities, and send healing energy to yourself or another female. Each knob of the candle (there are seven separate knobs) represents one wish you can make while burning that knob. Can be used for a variety of different wishes - one wish per knob. This item can also be used for wishes and meditations of a spiritual nature such as wishing and meditation for, healing, clearing, higher spiritual consciousness, enhanced magickal powers, etc. The white mummy is used to clear up negative communications, healing communication that has been damaged by misunderstandings, arguments, etc. Helps with starting up difficult communications. Break through someone's silence towards you. Warning! Please note that you should always be justified in using BLACK candle magick. You should truly have been harmed by a person before using this kind of magick. Justification is your best protection! When using BROWN candle magick, this isn't as harmful and should be used if you want to send someone away, punish them for a wrongful deed, etc. BLACK FEMALE IMAGE CANDLE MAGICK KIT: Used for summoning the ultimate harm to a female. 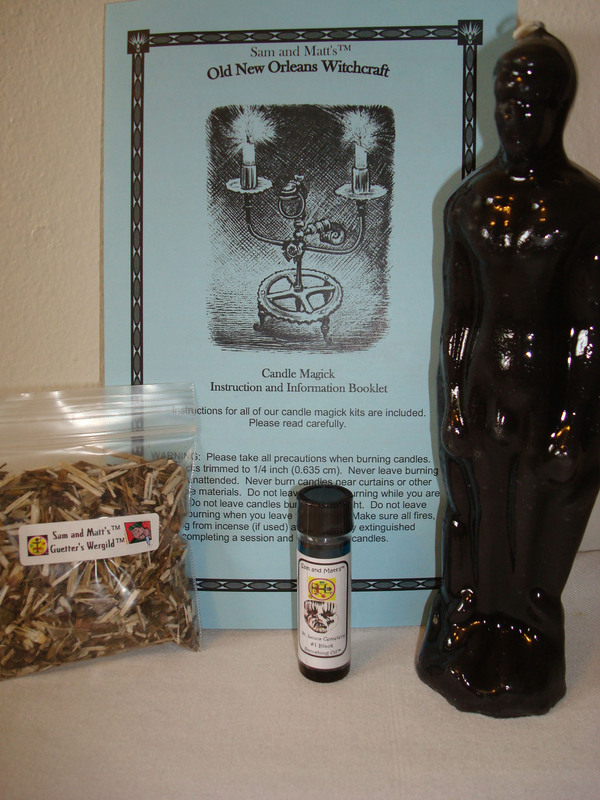 BLACK MALE IMAGE CANDLE MAGICK KIT: Used for summoning the ultimate harm to a maloe wishing the ultimate harm to a male. BROWN FEMALE IMAGE CANDLE MAGICK KIT: Used for sending a female away (harmed or unharmed, depending on circumstances), causing illness, inability to function, etc. BROWN MALE IMAGE CANDLE MAGICK KIT: Use for sending a male away (harmed or unharmed, depending on the circumstances), causing illness, inability to function, etc. Includes 1 candle, supplies,and complete instructions. The Black Mummy candle spell's possibilities are almost endless and this candle magick is appropriate for any purpose in which you wish to send darkness, despair and bad luck. NOTE: This mummy candle should only be used for ONE situation, not several. Using it for different situations weakens the candle magick. If you have more than one situation you need to exert control over, then you need a separate Black Mummy Candle Magick Kit for EACH situation. Like to create your own magick?! Using the proper ingredients is paramount to creating your own spell work. The following products may be combined (or used alone) to create your own powerful spell work. Any product below that has a similar use (love product, money product, luck product, etc.) may be combined for a single purpose so that you may customize your own spell work. Generally speaking, candles, oils, and incense for any purpose would be the start of a very good way to customize a spell for yourself. Add in herbs, gris-gris bags, bath salts, etc. to make a stronger spell that you create for yourself. These are traditional stick candles, colored all the way through (one should never use "dipped" candles for magick - they should be colored all the way through the candle), perfect for any kind of magickal endeavor. As with all our products, they are consecrated for you, but feel free to consecrate in your own tradition once you receive them. A pack of 10 6" candles for $9.95. VOODOO and WITCHCRAFT OIL PACKS We make all of our own voodoo and witchcraft oils, hand blended right here from our own magickal recipes. Rev. Corfield then consecrate the oils and we package them in generous 2 dram bottles. These are the most powerful Voodoo oils available - they are not mass produced. They are made in single batches using Rev. Corfield's family blend of New Orleans Voodoo recipes. There are three different bottles of oil to the packages. 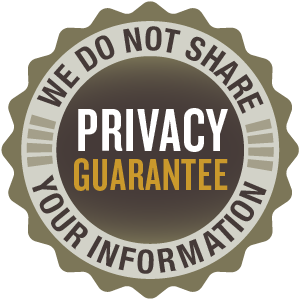 They may be used separately or together for the purposes below. We send you complete instructions how you might use the oils to your best advantage. Cosmic Voodoo™ Love Spell Oils Pack: Oils to stimulate your love life, help bring a love to you, attract lovers wherever you go. Irresistible! Use on candles, sacred objects, yourself, in the bath, etc. Use on yourself straight from the bottle to enhance all love situations or encourage a love situation to manifest. Perfect for enhancing any kind of love magick. 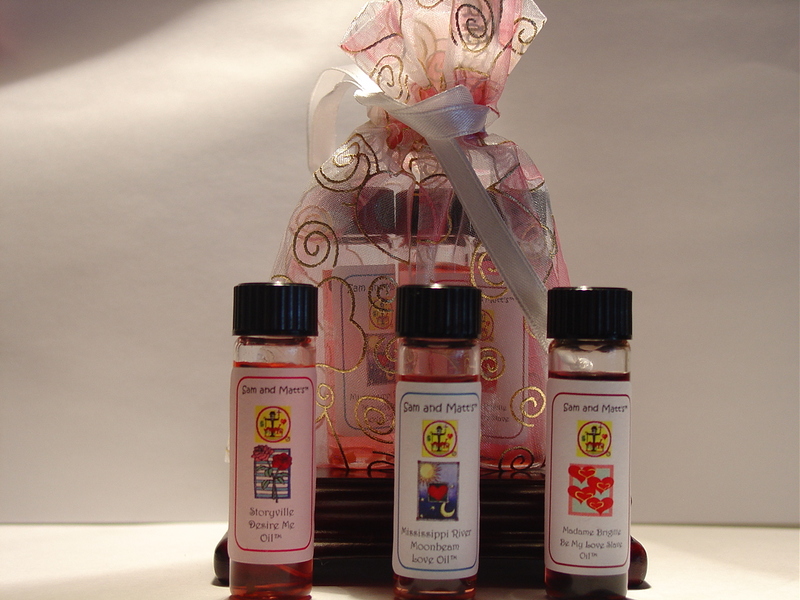 Cosmic Voodoo™ Attraction Oils Pack: A little bit different than the above as these oils can be used to attract friends and lovers, make you stand out in the crowd, assist you in attracting good things to come your way. Perfect for using on candles, in the bath, on sacred objects, for all love spell magickal attraction type work. 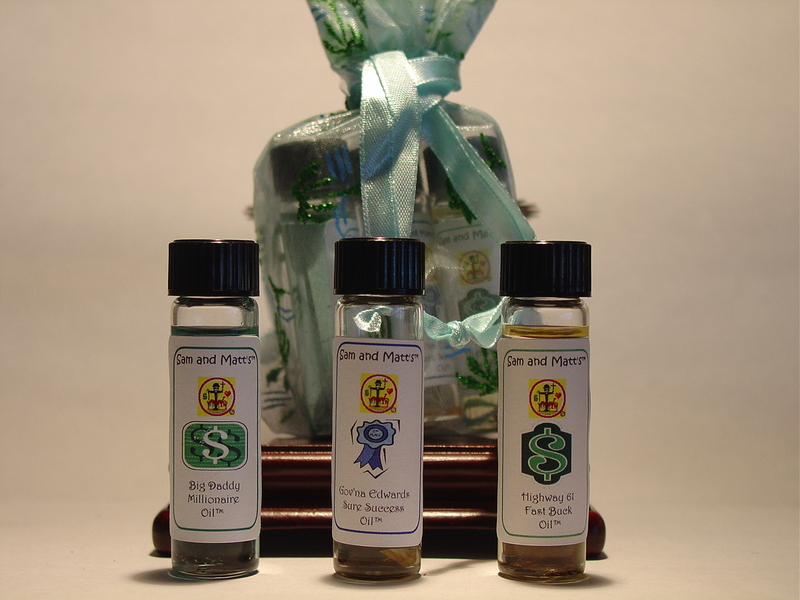 Cosmic Voodoo™ Success Oils Pack: Oils to enhance your chances of success in all situations: love, money, luck, etc. Enhances other oils used for various purposes. Increases of chances of success on job interviews, presentations, written works, etc. Burn some candles with these oils and/or put a few drops in a bath before going into situations where you want to be successful. 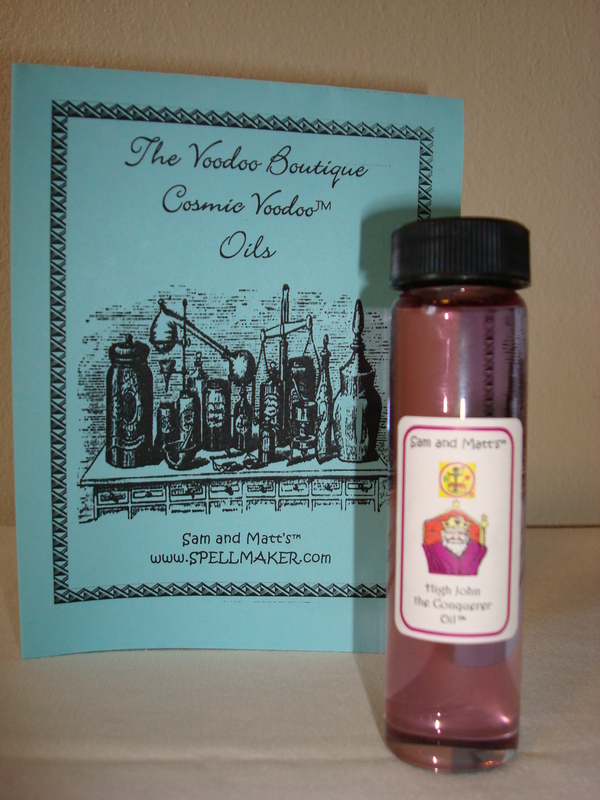 Cosmic Voodoo™ Power Oils Pack: Oils to make you powerful, have command over situations, puts you in control. Use for situations where you need strength, power, and enhancement of skills. Burn candles with these oils on it, put a few drops in a bath, or wear on you straight from the bottle to enhance and grow your personal power. Power over fears and weaknesses of yourself or others. 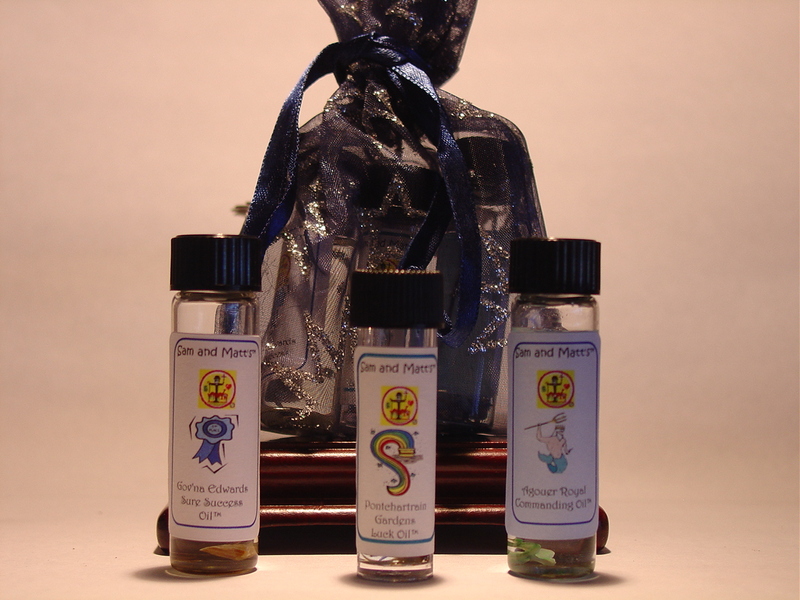 Cosmic Voodoo™ Money Oils Pack: Oils to help you draw money to yourself and others, if that is your wish. Great for gambling, lottery playing, enhancing money spell work, using before job interviews to ask for more money, applying for loans, etc. Use on candles, in bath, etc. Put a few drops on your wallet, in your purse, or anywhere you want to attract money. Cosmic Voodoo™ Revenge Oils Pack: Oils to help you banish your enemies, send them away, cause them to suffer losses, bring them great harm. Use wisely and with good reason, please. You should use these oils only on your true enemies. Be sure that you have been wronged through no fault of your own. All of our magickal oils are available individually in large 8 dram bottles with instructions. Please choose from the list below. Abre Camino (Road Opener)™ Oil: Used for classic removal of blockages, "opening roads," making things happen more smoothly and more quickly. Agouer Royal Commanding™ Oil: Used for help in controlling the emotions and actions of another. Big Daddy Millionaire™ Oil: For aid with drawing money your way and to become more aware of where it can be obtained. Erzulie Marriage™ Oil: To assist in the bringing about of a commitment or vow. Can be used for the merging or joining of any two people or organizations. General Toussaint Chase Away™ Oil: For help in removing (getting rid of) someone from your premises, work, lover, etc. Gov'na Edwards Sure Success™ Oil: For assistance in gaining honor, favors, awards, power, position, success. Hoodoo Love Attraction™ Oil: To draw favorable attention to yourself. May be used to help in bringing others around to your way of thinking. Hwy. 61 Fast Buck™ Oil: Get help in gaming: lottery, cards, dice, any game of chance or contest. Also use for drawing money to you or to become aware of a source of money. Madame Brigitte Be My Love Slave™ Oil: To help in making someone do your bidding or act as your love "slave." Mississippi River Moonbeam Love™ Oil To kindle or enhance romance, for getting a friend to see you as a possible lover. 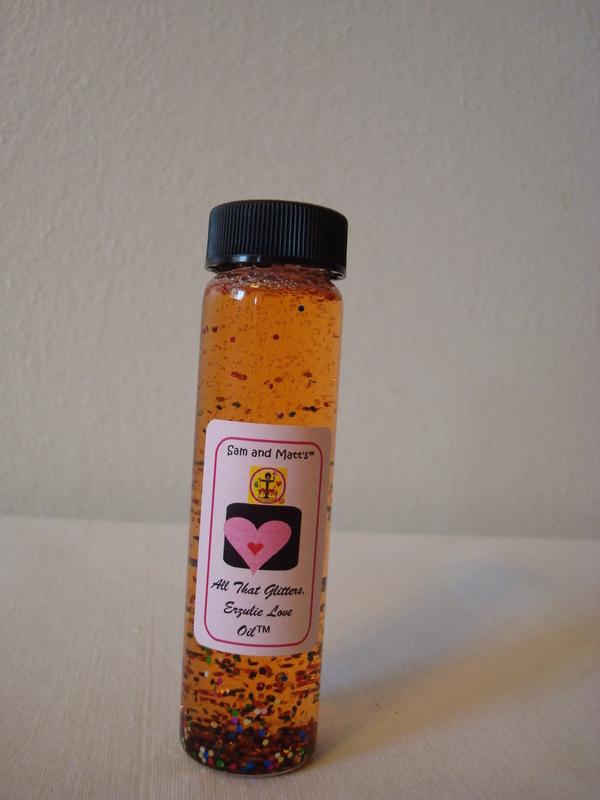 Mistress Marie Love Magnet™ Oil: For drawing a specific person into your charms or to draw many into your web of love and lust. Pontchartrain Gardens Luck™ Oil: A little help for those who need or desire it. Bring favorable things into your life. St. Louis Cemetery No. 1 Black Banishing™ Oil: Put them in their place--in confusion, self-doubt, and outta here. Storyville Desire Me™ Oil: Used when you want to make them desperately want you for love and/or lust. 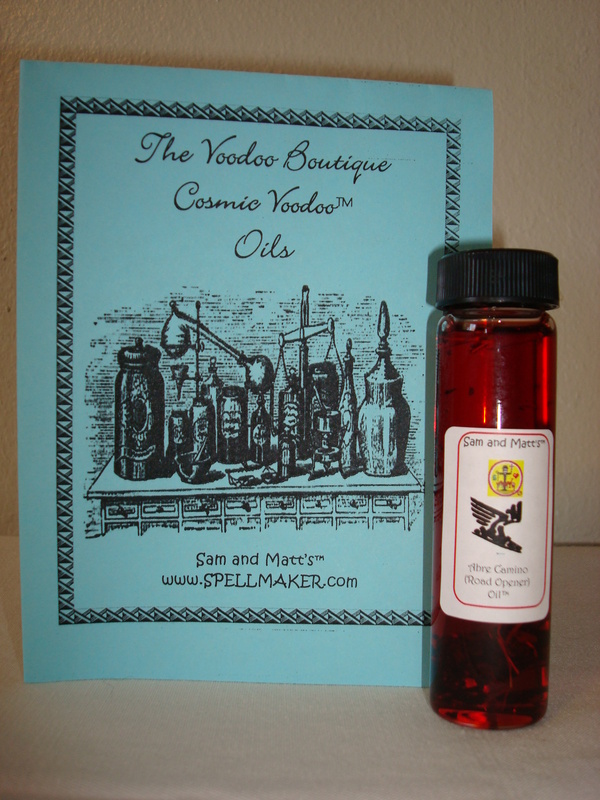 Voodoo Nights™ Magick Dream Oil: Assists in bringing magickal dreams. Use to petition for someone to dream of you. High John the Conqueror Oil: May be used for protection and luck in all things. The use of High John Oil is a very old practice steeped in powerful tradition. 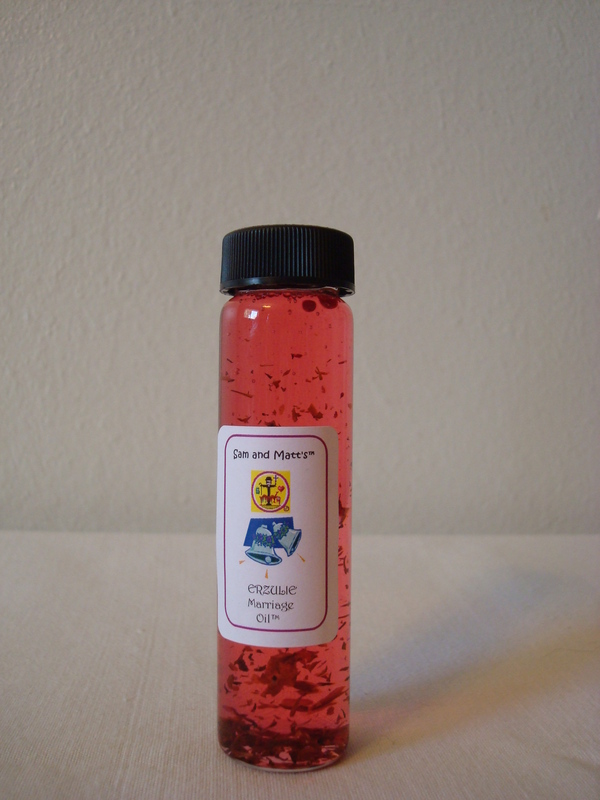 Samantha's Spiritual Power™ Anointing Oil: For spiritual purposes. Consecrating, blessing, and dedictaing various items for sacred purposes. 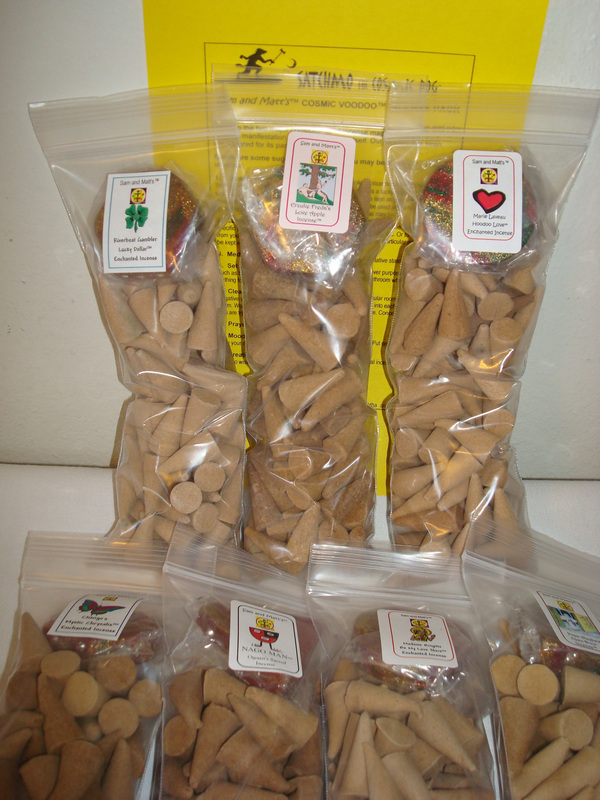 All of our incense comes in large packs (50 cones or more) with free incense burner and complete instructions. The magick of incense! All of our incense packs are consecrated before sending to you. It helps set the mood for spell casting or can be used just onto itself. Use it with your favorite candles to help set the mood for success in whatever you endeavor. Again, for serious magick, it is not a substitute for a complete spell or a spell kit. Each title below contains at least 50 voodoo incense cones, a FREE incense burner, and complete instructions. Marie-Laveau Hoodoo Love™ Incense: Set the mood for love! Madame Brigitte Be My Love Slave™ Incense: Use to bring that special one into your life. 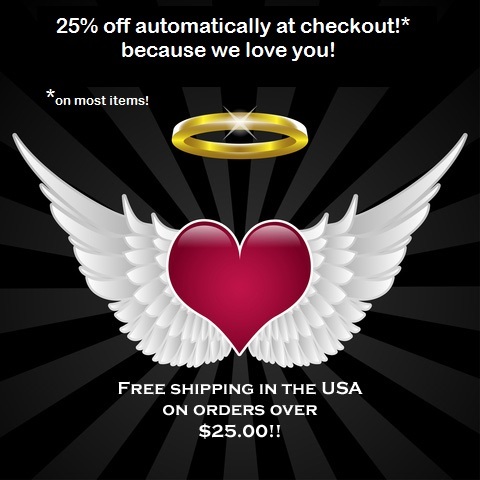 Mistress Marie Love Magnet™ Incense: Use to draw love to you. Madame Brigitte Break 'Em Up™ Incense: Did they leave you for another?? Burn this incense for them. St. Louis Cemetery #1 Banishing™ Incense: Send that creep away! Riverboat Gambler Lucky Dollar™ Incense: Just what it says! Luck in gambling, money, etc. Chango's Mystik Chrysalis™ Incense: To bring about a change, in yourself or others. May be used for transformation or to attempt to cause an effect. 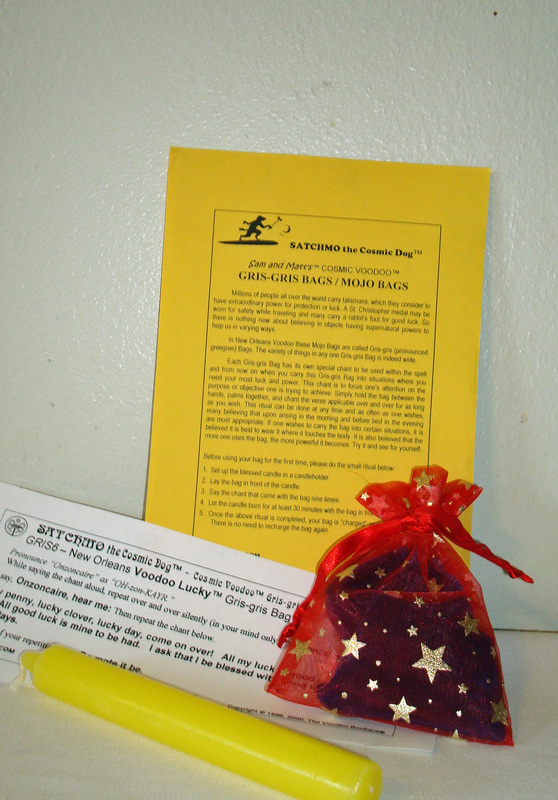 All gris-gris bags come with candle and complete instructions. Voodoo bags, gris-gris bags, mojo bags - many different names have been attributed to these little cloth bags carried by voodoo practitioners. 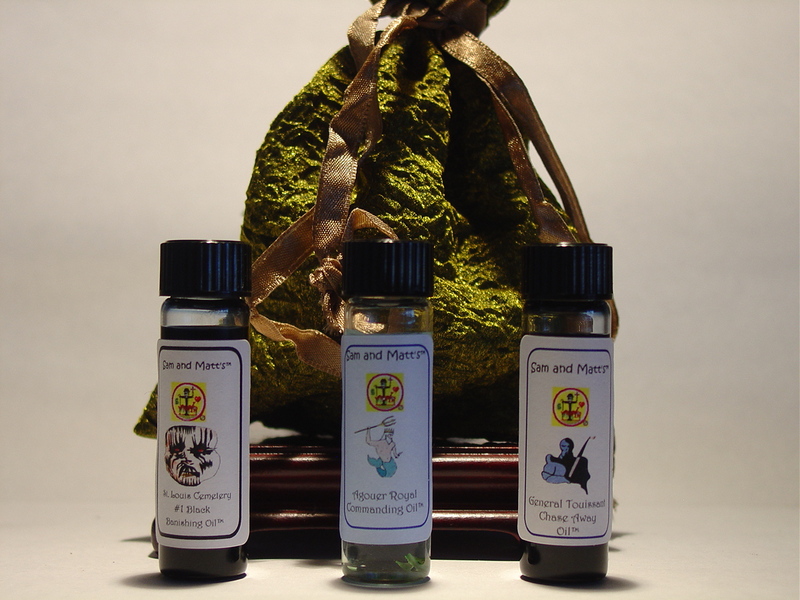 Our consecrated gris-gris bags are filled with herbs, powders, and special amulets. A special chant and FREE blessed candle is included to help you activate the bag. They are carried as talismans to help you bring about what you desire! You may also add things to the bag. Your instructions tell you how and what you might add. As with the other products above, they are not a substitute for spells, but are carried by literally millions of people as lucky charms. Better get yours! New Orleans VOODOO LOVE™ Gris-Gris Bag: For bringing a little (or a lot of) LOVE into your life. New Orleans VOODOO MONEY™ Gris-Gris Bag: Use to become aware of various channels through which you may obtain financial means. New Orleans VOODOO MARRIAGE™ Gris-Gris Bag: Don't want to remain single? Use this in your quest for the perfect mate. New Orleans VOODOO WISH™ Gris-Gris Bag: Use as an aid to acquire the object/person of your dreams. New Orleans VOODOO POWER™ Gris-Gris Bag: How do you measure success? Use to discover new ways to bring yourself up to your expectations. New Orleans VOODOO LUCKY™ Gris-Gris Bag: Can assist in bringing fortunate circumstances your way. New Orleans VOODOO PROTECTION™ Gris-Gris Bag: Turn danger away. nice carry bag, feeding oil, and instructions. High John the Conqueror root (we use a nice-sized piece of High John root or two smaller pieces depending on our batch of roots - it is a naturally growing root, so we never know what size they will be) blessed by Rev. Samantha Corfield, anointing oil, carry bag, and instructions. High John Root is considered the most powerful magickal root and is carried to enhance magickal powers, luck in all matters, control, and power. NO magickal practitioner should be without this Root Bag. 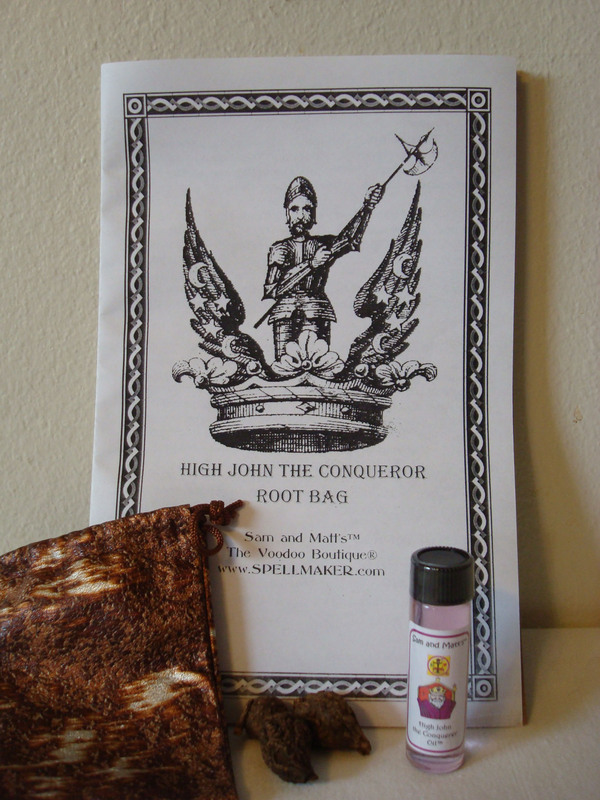 Qty: Order 1 High John the Conqueror Root Bag ($24.95)Temporarily out of stock! Generous bag of magickal herb mixtures for burning or carefully strewing about. Charcoal and complete instructions for usage included with each title below. Use when you desire to have someone take a romantic interest in you. Use when you wish to join with someone for love or lust, or wish to have them make a commitment. Use when you desire to have someone take a romantic interest in you. Madame Brigitte Be My Love Slave™ Herb Pack: When you want someone to fulfill your desires. 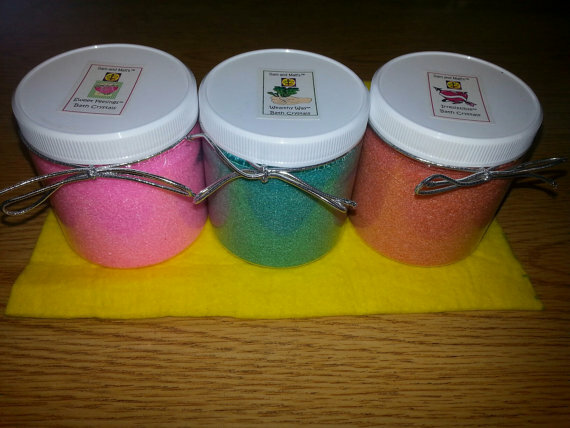 Sweet Feelings™ Bath Crystals Pack: For generating tender thoughts of love. To bring passion to the occasion. Irresistible™ Bath Crystals Pack: When you want to be "irresistible." Bayou St. John™ Bath Crystals - 8 oz. Bring Luck, good fortune, favors and success into your life. Wealthy Way™ Bath Crystals - 8 oz. This is a money bath. 4 oz. bottle of Florida Water consecrated by Mambo Sam. This traditional water is used for cleansing the area upon which you will do your magickal works. You can also use it to cleanse any magickal tools, your hands before doing magickal work, etc. While this is traditional Florida Water, it is more powerful than Florida water you can buy in any store as it is consecrated. 4 oz. bottle of Rose Water consecrated by Mambo Sam. This is traditional rose water used for cleansing the area upon which you will do Love Magick. You can also use it to cleanse any magickal tools used for love or to cleanse yourself, your hands, etc. 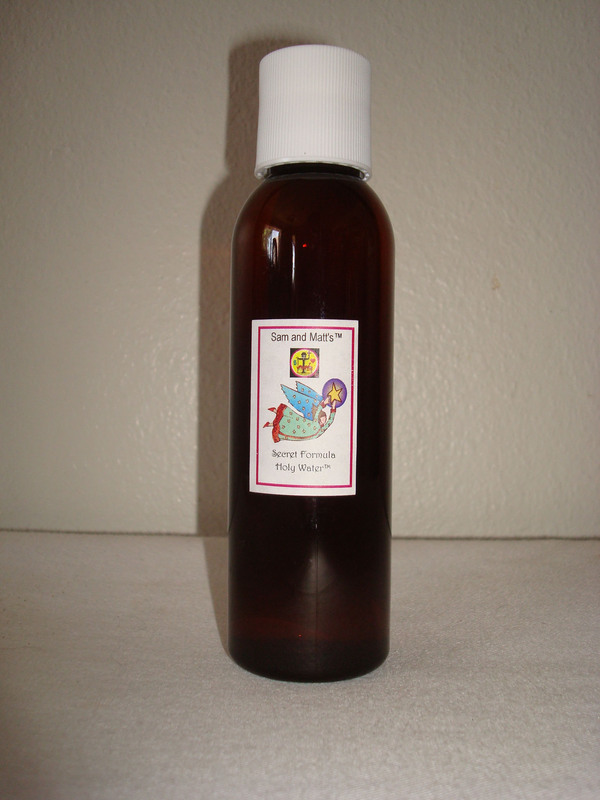 This rose water is consecrated on the point of love goddess lwa Erzulie Freda. 4 oz. bottle of Kananga Water consecrated by Mambo Sam. This traditional water is used for cleansing the area upon which you will do any kind of magickal works for personal or spiritual power. You can also use it to cleanse any magickal tools,your hands before doing magickal work, etc., where you need to add more power to the spell. While this is traditional Kananga Water, it is more powerful than that which you can buy in any store as it is consecrated on the point of power lwa Ogoun Feraille. Samantha's Secret Formula™ Holy Water: For aspersion, consecration, blessing, etc. Satchmo is with us still.